They didn’t actually look this flourescent. Although Restaurant Week has just concluded, I once again took the opportunity to try out a couple new places that I wouldn’t ordinarily visit. The first was Malo in Silverlake, which is a Mexican Cantina. Their menu wasn’t exactly exciting for me, but I still thought the place could surprise me. The reason the menu wasn’t exciting was because there was really only one good unvegan option for both the appetizers and entrees. For the appetizer, it was their Salsa Flight. 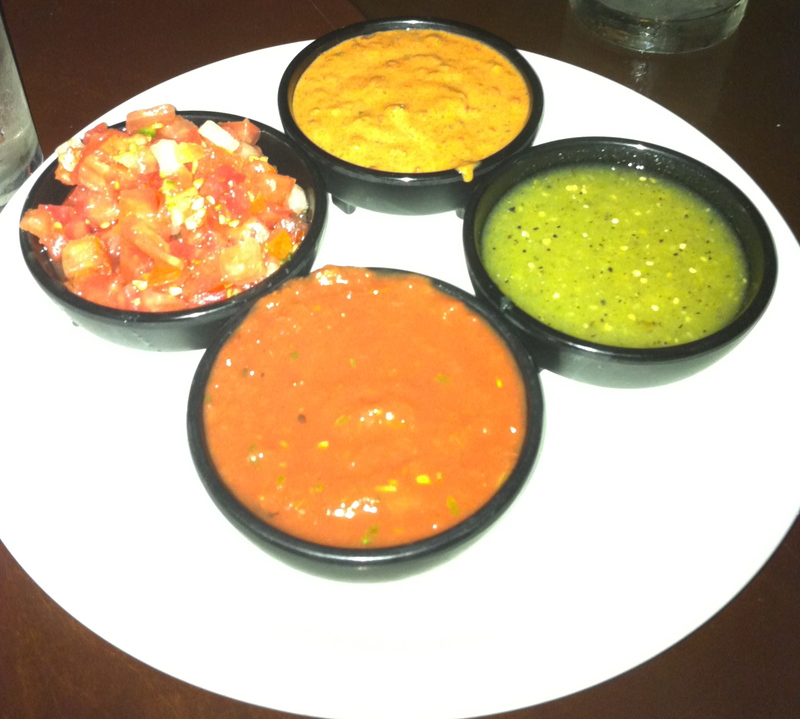 This flight carried some red salsa, verde, pico de gallo and some sort of creamy-ish salsa. When the flight came, I passed the pico de gallo off and went to work on the other salsas. Surprisingly, I found that the creamy salsa was the spiciest, but also had some great flavor. The verde and red were also pretty good, with the red having better flavor and the green having a better kick. Once I learned the subtleties of the salsas, I started combining the creamy one with the the other two to make a far superior salsa. Lots of color, little flavor. For the main course, my only real option was their Pollo Asada. 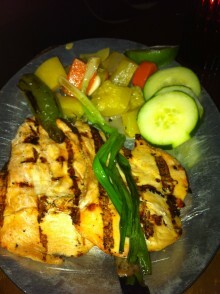 It came with some vegetables that I didn’t order without so that other people could have them. This butterflied breast looked pretty good, but upon eating I discovered it was relatively flavorless. This was very disappointing, but would have been a lot more disappointing if I hadn’t ordered the flight of salsas. So rather than suffering through tasteless chicken, I started dipping it in the salsa to actually enjoy. To finish off the meal, I actually had a tough time choosing which dessert to get. Finally, I ordered the Capirotada. 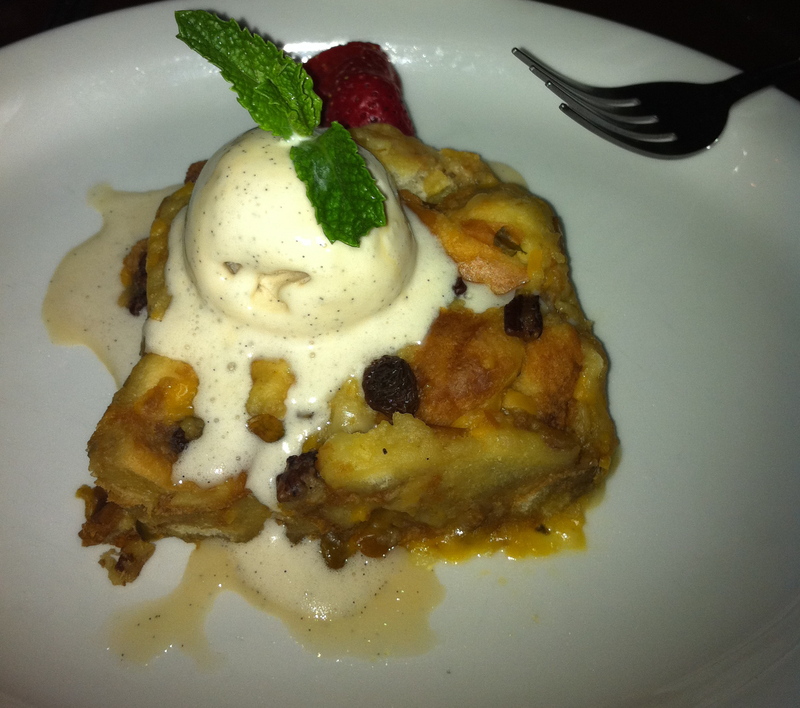 This Mexican bread pudding was a delicious way to finish up the meal. The combination of orange, vanilla, raisins and whatever else they threw in there just ended the meal on a good note. I also tried out the other desserts, a tres leches cake and flan, and found those both to be tasty as well. I don’t see any pudding, but I like the bread. Unfortunately, good salsa and a good dessert isn’t enough to carry a meal. The meat of my meal (double entendre!) was quite disappointing and made the $26 prix fixe seem a bit pricey. I might consider going back to Malo for a burrito or taco some day, but I won’t be back for Restaurant Week unless they find some real entrees.